Ethics can be complex, to be sure. But ethics start with the individual — and what he or she says and does — each and every day. “A lot of times, people think about ethics as these huge, great, big acts, and what they are is, each of us making tiny acts in our world and in our actions and in our words that shape the trajectory of a curriculum and the culture of an organization,” said Catharyn Baird, CEO of EthicsGame, a trademarked curriculum to help students recognize core ethical frameworks; the strengths and weaknesses of their own ethical preferences; and to identify, navigate, and optimally resolve ethical tensions. Baird met with around 400 students in October to work on ethics exercises as part of a renewed focus on ethics at the Eli Broad College of Business. Starting this semester, EthicsGame activities are part of General Business and Business Law (GBL) 385: Business Law and Ethical Leadership, a required business class. 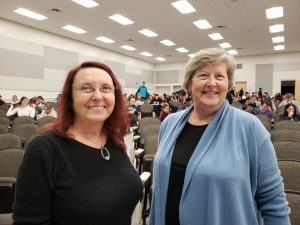 “I hope it’s going to position them to be very careful when they choose employment, and when they get into the workplace, to be able to check in with themselves, know their weak spots, and be able to behave according to their own values when they hit ethical dilemmas; and first of all, recognize an ethical dilemma,” said Professor Paulette Stenzel, coordinator for Business Law and Ethical Leadership. Without that foundation, “we can be on autopilot and not even realize the roads we’re heading down, in terms of making choices that might not be in tune with our own ethics and the core values of the organization for which the person is working,” Stenzel said. Merger Madness, which helped students understand how their values compare to and contrast with those of others. This fall’s exercises included a heavy done of contemporary issues. “We’re looking at it through the lens of the ‘Me Too’ movement, harassment, and what little, tiny behaviors each of us can make and actions we can take to make this world a better place,” Baird said. Baird has also seen a shift in recent years in how men and women interact with each other in the business workplace. The move toward a stronger ethical emphasis at the Broad College has been building for some time. Stenzel said the college moved from using a common textbook to teach ethical leadership, to the creation of a leadership speaker series, to the use of EthicsGame activities in some honors courses, to now.